So you’d love to have a party during the holidays but think youdon’t have enough time? Think again. This hearty appetizer menurelies on purchased, almost-ready foods. With a few tweaks, theylook like specialties of the house. The night before: Assemble serving containers, utensils, andingredients. Measure any ingredients that can stand, covered, atroom temperature or in the refrigerator. Heat sausages and keep warm (in chafing dish with hot-waterbath or on electric warming tray). Prepare shrimp and Belgian endive. Rinse vegetables. Moisten peeled baby-cut carrots withseasoned rice vinegar to keep fresh-looking. Group vegetables anddips on trays. Put olives, nuts, breads, chips, mustards, and sour cream inserving dishes. In addition to the recipe ingredients, you’ll need thefollowing. Sausages: 1 1/2 to 2 pounds ready-to-heat cooked sausages,such as chicken-apple, fennel, or Polish (kielbasa). Usemini-sausages or cut large ones into 1-inch chunks. Heat them in afrying pan, the oven, or a microwave oven. Accompany with two orthree kinds of mustard and serve with miniature pocket bread (16 to24 pieces, cut into halves). Vegetables: 2 to 3 pounds. 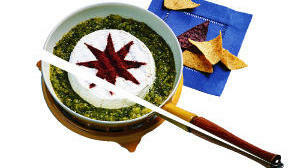 Savory dips: 2 to 3 cups hummus, tapenade, guacamole, orother favorites. Olives: 2 to 4 cups, such as ascolano, kalamata, manzanillo,and niçoise. Seasoned nuts: 2 to 4 cups.